On Monday I posted a contest to name all six dinosaurs in the puzzle I made for Galison/Mudpuppy. As of noon today there were six correct entries. Blue/turquoise – Brachiosaurus, formerly known as Brontosaurus, which I accept as a correct answer. So as I said, six people got all six, though many of you should watch your spelling. I assigned each of you a number (1 – 6) and then I used a random number generator to choose a number from one to six. One came up, (the actual order was 1, 3, 6, 5, 4, 2) which happened to be assigned to……………………..
She’s an author and mom of an almost-3-year-old and creator of Pajama Girl. I know this because I looked her up. She entered about forty-five seconds after I posted the contest, so she apparently knows her dinosaurs. Sarah, I’m gonna send you an email so I can get your address. In the meantime, congratulations. A new dinosaur puzzle. I must like dinosaurs because I draw a lot of them. This is a cool little thing from Galison/Mudpuppy, for whom I’ve made a lot of toys and puzzles. Six dinosaurs and one puzzle. The puzzle comes as a series of nine cubes, with each side being a piece of one of the puzzles. You can get this here at the Mudpuppy site. I have an extra one of these and I’d like to give it away to someone, so I thought I’d have a little contest. There are six dinosaurs here, right? Send me an email with all six dinosaurs correctly listed (and list the colors so I can tell which one you’re naming). Of all of the right answers I’ll pick one winner from random, okay? So you have this week. I’ll pick the winner on Friday afternoon, around 3pm Eastern Time. Send your email to brian at mrbiggs dot com. You could leave it as a comment if you want, but then you’d be giving your answers away to everyone who reads this post. So instead of doing that, use email, and then just write a funny joke about dinosaurs in the comments. Cool? Oh yeah, the winner has to send a picture of themselves building the puzzle when they get it. Okay? Good luck. Thanks to all of you geniuses whom entered. These were really amazing! The judges labored over the entries for eons, disagreeing and reagreeing and finally with secret tie-breaker rules, narrowing the selection down to ten first-place winners and one grand prize. The Grand Prize was unanimously given to Sarah R, for her poem about the witch which was also the first place prize for that witch trick-or-treater. The other nine prizes go to Viv Rae, Mitchell (who got two), Nathan, Brad, Sarah (no R), two more for Sarah R, and Abi (Mitchell’s sister!). You can read all of the winners here. My personal favorite was Sarah R’s Otis Owens but I wasn’t one of the judges. It just made me LAUGH and every time I read it, it creeps me out. Thanks again to everyone. One of the Sarahs mentioned that I should do a Christmas contest as well, and I think I’ll consider it! All you winners can you send me your postal addresses via email, so I might mail out the awards next week? Thank you! Happy Halloween. Entries are closed and the judges will be working on the deciding. I hope to post the results here today so stay tuned. I’ve read all the entries and they are wonderful, so thanks. Is that a knock? Do you hear it? It sounds timid. It must be a fairy. 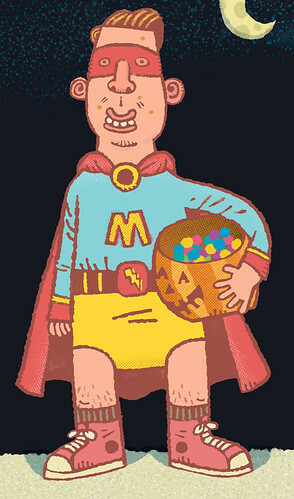 This is Trick-or-Treater number 10 of 10 for the contest to name and describe the character. Have at it! Winners announced on Halloween. Bzzt. Beep. There’s someone at the door. Aww a cute trick or treater! You give it some candy and close the door and then you wonder: Was that? What the? 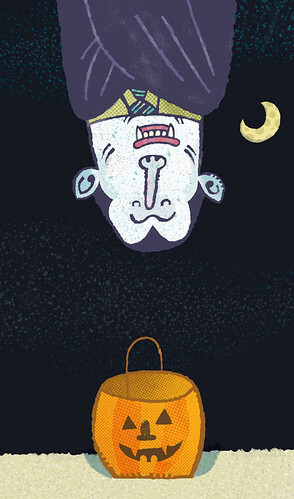 This is Trick-or-Treater number 9 of 10 for the contest to name and describe the character. Go, get started! Winners announced on Halloween. Hi, I have some information regarding the rewards for the hard work many of you are putting in to the Ten Trick or Treaters contest. First, a disclaimer: This contest is not related in any way to the book of the same name by my wonderful editor, Janet Schulman. I had no idea about that book until Judy Sierra, one of the judges, told me about it. The irony is that this was going to be TWENTY Trick or Treaters but time did not allow. It’s a lovely book, so check it out. Ok, here’s how we’re doing this. There will be a total of ten prizes. Each of the ten characters will have a 1st prize for the favorite name/description of the character. Then one of these, the best one, will be designated the “Grand Prize Winner.” Each of the first prizes will get a signed, very nice print of the character with the name and description in question. The grand prize is the first place prize with a copy of the book that judge Judy Sierra wrote and I illustrated, with autographs. So if that’s not worth an entry, I don’t know what is. There are eight characters up currently and two more will be up on Thursday. Thanks and have fun! 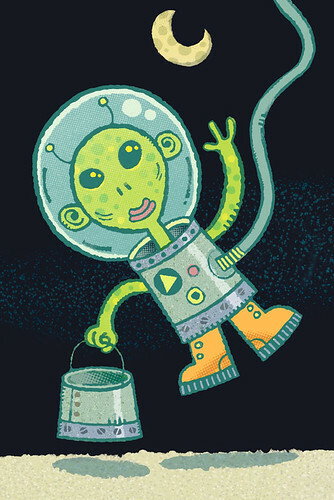 This is Trick-or-Treater number 8 of 10 for the contest to name and describe the character. Get started! Winners announced on Halloween. Whoosh! You hear an unusual noise at your door. It’s Halloween, so it’s probably some kid in a costume. Imagine your surprise when you find this guy, all six feet of him, awaiting his treats. Who the heck is THAT? 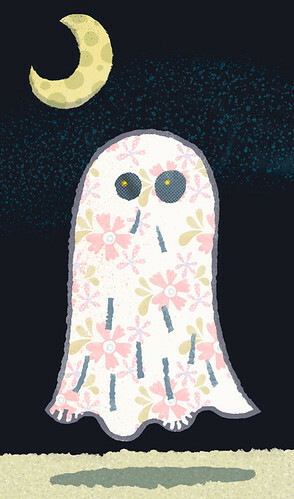 This is Trick-or-Treater number 7 of 10 for the contest to name and describe the character. Get started! Winners announced on Halloween. Tap tap tap… You hear something rapping on the door. Who is this fellow hanging around? Is it just candy that he wants? 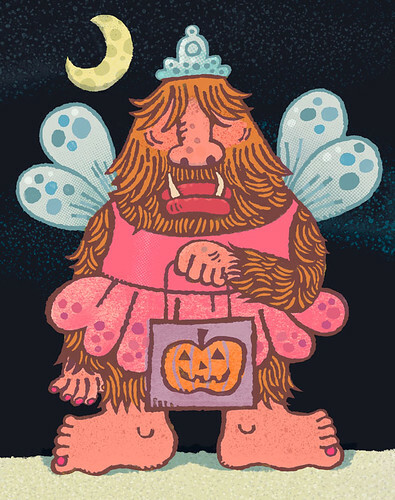 This is Trick-or-Treater number 6 of 10 for the contest to name and describe the character. Get started! Winners announced on Halloween.